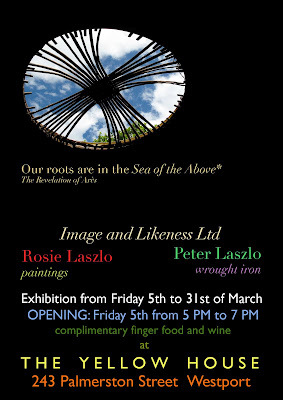 At the moment Peter and I are focussing on our next exhibition: "Our roots are in the Sea of the Above"
opening from the 5th to the 31st of March in Westport. 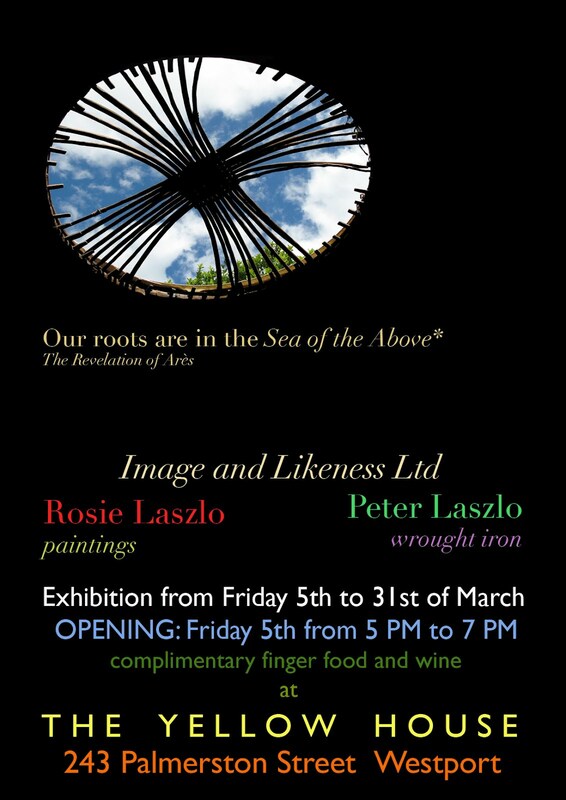 You are all invited to the opening and we look forward to meeting you. The poster is made with a picture taken from the inside of our yurt -our home, an Afghan tent that we brought with us from France. We chose this picture because it is the vision that inspires us all the time and we wanted to share it with you. To us it means be humble, be free, reconnect with our true nature, be one with the Source and the world... Letting ourselves be inspired to be good, feeling great joy creating. Bravo et felicitations pour cette exhibition / exposition de vos travaux. Touchez les "hauteurs" est un tres beau but, d'autant plus quand le projet est d'elever l'ame de l'autre. Really good work to discover on the web. Touching the"Hights" is a difficult but giving a real joy. Thak you for that and I'm happy earing about you. Merci dear Bruno,pour ton appréciation et aussi de nous rappeller que le projet est d'élever l'âme de l'autre... Comme Peter le dit souvent : We are here to help each other et j'ajoute, à gravir les Hauteurs du bonheur. C'est de Là que nous venons et que consciemment ou pas, nous tendons à revenir. Nous marchons avec toi sur ces chemins. Bliss all around you.